You may have started planning your Christmas feast but have you considered what you will do to decorate the table? Create your own centrepiece… This is glass bucket with wildflowers and some Christmas decorations pushed in amongst the flowers. Put a few on kebab skewers to give height to the display. 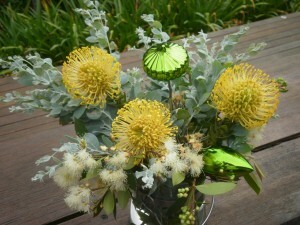 Create a bouquet to enhance your table setting but remember to do something different and experiment with colour. That way everyone with know it is your own work. Lemon & Lime a fresh new take on Christmas.